The exit of Saturn, Pontiac, Saab and Hummer allowed some extra elbow room for the existing General Motors brands and Cadillac made the most of it, offering a whole area to feature their popular high-performance V-Series models and the new CTS-V Coupe race car. Around the perimeter of the Cadillac display at the 2011 Detroit Auto Show, GM’s luxury brand offered a look at the current models like the CTS lineup (wagon, sedan, coupe), the SRX crossover, the STS sedan and the Escalade lineup but the main attraction was the collection of Crystal Red Tintcoat V-Series models surrounding the new CTS-V Coupe race car. Sitting among these gorgeous ruby red performance models was a cut-a-way of the 6.2L LSA V8 that powers the CTS-V Coupe, Sedan and Sport Wagon, churning out 556 horsepower with the help of a root-style supercharger. The engine display gives show-goers at the intricacy of the induction system on this amazing Cadillac performance engine and just beyond the engine stand was the crown jewel of the Cadillac Auto Show display – the new Pratt & Miller built CTS-V Coupe SCCA race car. Cadillac has been out of factory racing for a few years but the rampant (and understandable) interest in the V-Series vehicles have prompted GM to call upon Pratt & Miller (makers of the Corvette C6R race cars) to put their luxury brand back in SCCA racing. A pair of these Caddy racers will debut in March, driven by long-successful drivers Andy Pilgrim and Johnny O’Connell. 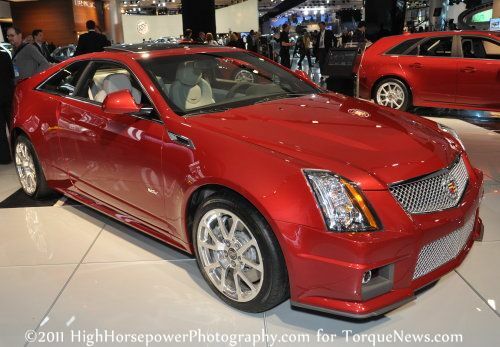 Check out the gallery below for a closer look at the 2011 Cadillac V-Series lineup from the 2011 Detroit Auto Show.